I guess the part I am most curious about is why the Otomo were disbanded. Kanpeki's first wife was an Otomo. The Spider Clan maintained close ties to Otomo Suikihime in the Colonies. Kuroko married an Otomo. Other than Winter Court IV, the Otomo and the Spider have been thick as thieves, and with Seiken disbanded the Imperial Bureaucracy and favoring the Great Clans over the Imperials, I'm curious about why you would have Hantei Kanpeki disband who, theoretically, could be his greatest allies. Personally, I would treat WC4 as a fluke in the otherwise solid relationship between the Spider Clan and the Imperials. I'd argue that the Spider and the Otomo aren't so much "thick as thieves" as it is that; the Spider are were rebellious and disgruntled Otomo go. Takuan was the heir, his leaving to marry into the Spider was scandalous and left the Otomo with a not so great heir. I believe Kanpeki's wife was also of the rebellious sort. Suikihime, I'm not 100% up to date on, but I don't feel she was on good relations with the majority of the Otomo family, there's a reason she was in the Colonies. Mind you that doesn't mean, that that relationship couldn't be repaired. And with Seiken himself disbanding the Otomo, I would not have been surprised to see them join up with the Susumu in protest. - A mighty and everlasting empire of darkness, ruled over by blood sorcery, zombies and slavering oni? - An empire of ruthless and uncompromising strength, pitiless of weakness, with no need to lean on a crutch such as the favour of an otherworldly realm? - The glory days of the Hantei restored, proving that Daigotsu was right all along about being the rightful heir to the throne, for none of these non-Hantei poseurs can keep the Empire in line! All depends on what draws one to the Spider, really. But I wouldn't feel shackled to the need to have Jigoku play a central role just because "it's Onyx." I have my personal preferences, of course, but this is a perfect example of the need for discussion, I want to hear as many people as possible on this issue. My personal vote would be #2 - I prefer my Rokugan un-Spidered, ideally, but if one is going to have an alternate setting about the Spider taking over, one should do something with it. And I find Jigoku quite boring, frankly. It obliterates moral complexity. Who's the bad guy here? Well... that guy. He worships Jigoku. So let's have a Spider-y Rokugan that's about human people making human decisions. But! I am not primarily a Spider fan. And this is, of course, a Spider-centric setting. So my preferences in that regard are not the most relevant. On a side note, one of the biggest obstacle to KAnpeki's reign is the fact Seiken is the rigtheous emperor. For a majority the Great Clans to side with Kanpeki, it would require him to go insane on a level even beyond the black crysenthemum. Good thing the story team offered us a perfect opportunity. Eh. It could work, but supernatural madness as an explanation feels like a bit of a cop-out to me. I think the situation can be set up well enough based on purely human failings; Seiken is egotistical, inflexible, and idealistic to a fault. If he opens his reign by slashing and burning his own government and decreeing harsh punishments for the Clans that didn't support him, while the Clans that did support him are busy waging total war on one another... open warfare over the Imperial succession was already in the offing. I think the first person the anti-Seiken constituency would turn to is Shibatsu, but if he refused to countenance such a thing, then I think there'd be fertile ground for Kanpeki to build support for his own claim. Hmm. Perhaps that could be a trigger for a movement against Seiken? Someone of influence, concerned about Seiken's policies, approaches Shibatsu to propose either deposing Seiken in favour of Shibatsu, or trying to take authority away from Seiken ala the Gozoku. Shibatsu, out of loyalty, reports it to his brother, and Seiken punishes the traitor... and everyone even conceivably associated with them. A great many more people are suddenly thinking that something needs to be done about Seiken, and they also know that going to Shibatsu will not help (even if Shibatsu himself may now be having second thoughts of his own). You mention the Steel Chrysanthemum, but I think his reign proves that an Emperor who goes too far will drive his own subjects to turn on him, and Hantei XVI was a political mastermind running a vast and efficient police state. Seiken is certainly not the former, and has neither the time nor the intent to create the latter. And in the case of Hantei XVI, there was no alternative claimant or other legal cover for killing him; the Seppun turned on and murdered a crowned Emperor because they could no longer tolerate his behaviour. Kanpeki and his supporters, by contrast, can advance arguments of dynastic legitimacy to justify their own moves. - Kanpeki is not going to get the support of both the Crane and the Otomo, given the situation as of Seiken's coronation. So assuming neither side flips him off out of hand, he has to decide whose support will be more useful to him... and maybe I'm biased, but I think the support of an entire Great Clan with armies, economic networks, and the richest farmlands in Rokugan is going to be of more use to him than that of a few thousand bureaucrats whose power is ultimately based on convention and vapour. Kanpeki will need someone to run his Empire for him, but the Crane can do that just as well as the Otomo. - Kanpeki's wife was born an Otomo, but as I recall she despises the Otomo. As does he. Likewise, Suikihime hated the rest of her family for being obsessively-traditionalist sticks in the mud, and they hated her for being a dangerous progressive. The Spider have been close to the Otomo since they were legalised, but it's not because they like them, it's because Otomo patronage was useful to them and no-on else would deal with them. Frankly, I think Kanpeki would enjoy having them turfed from office and killed if he could manage without them. I find Jigoku quite boring, frankly. It obliterates moral complexity. Who's the bad guy here? Well... that guy. He worships Jigoku. So let's have a Spider-y Rokugan that's about human people making human decisions. This evoked feelings in me, but I did not want to derail this thread, so I made a new one here to discuss in: Jigoku, Morality, and You! Could you see the Phoenix serving an untainted Kanpeki, Gunichi? After the general political trends leading up to Onyx? Not really. Now, granted that the fiction wasn't exactly thick on the ground, this is mostly based on Winter Court, but... the Spider have zero track record for giving the Phoenix anything but bland contempt- and really, given the Phoenix reputation for pacifism and the Spider's "Might Makes Right" mentality, that makes sense. And since Winter Court is all we have to go on (and since, canonically, it means the Phoenix chose to send a delegation led by an Inquisitor, containing another Inquisitor and a Jade Magistrate), who are the Phoenix chummy with these days? The Crab, the Lion, and kinda/sorta/maybe/no, not really the Scorpion. For the Phoenix to back Kanpeki... he'd pretty much have to not be Kanpeki, because he is, by definition, a usurper who sees shugenja as tools to use to advance his agenda. This is one of those things where the more I think about it, the harder it gets to sell. Unless there is a radical change in the leadership of the Phoenix. A new regime that enthusiastically supports research into pure maho (or even actual maho-tsukai) could be convinced to work not-against Kanpeki. That puts us in Quislingland, which is, you know, fine, if that's the stated goal, but falls under my earlier comment that "it's not really the Phoenix clan as we know it." Also, I doubt the Soul of Shiba would take it well. And as my favorite Asahina Phoenix-hater's player noted, that is perfectly fine for a Spider-centric game, but... I think this particular square peg should be spared further attempts t mash it into a round hole. I like some of Goju's ideas. Complete alternate timeline with no need to try and reconcile events from the canon. That way there's no need to try to force a square peg into a round hole and we can have more organic reactions between the clans. Even with the premise of Kanpeki becoming Emperor, a complete alternate timeline makes it possible to portray the clans as they are instead of trying to force them into round holes not meant for them. In essence, I doubt we will find an agreement since this is supposed to be an empire in which Kanpeki rules. The real question should have been, how do you want your clan to be corrupted? What elements do you want to see preserved, what would you like to see twisted? Remember, this is a Spider fantasy we are talking about. You might not agree on the end result, but the good news is it's not the official storyline. What I'm asking you really is to take the mantle of the villain and twist your favorite clan into a mockery of itself, but one you would enjoy (albeit to a lesser degree I'm sure) to see grow as an alternate reality. EDIT: Wall of text alert. I edited the first post with an idea for a timeline leading to an Onyx empire. I want your comments. This is what happens when I have too much time to think about something. I mean, you want Council under Kanpeki? Kinuye, and then four other maho-slinging chumps. Nothing the Chuda can't bring to the table. Clan Champion? Since the Soul of Shiba ain't gonna play ball, it's just the biggest, ugliest, stompiest Shiba they could find who'd bend the knee. Daigotsu Bushi lite. Asako Henshin? Maybe they one-up the Order of the Spider from time to time, but the Path of Man perverted would leave us with the ugly illegitimate children of the Order of the Spider and the Kokujin. Phoenix lose their complexity when they go whole-hog,and the Spider's long tenure having an evil version of everyone else's stuff means they generally do "______ but Evil" better. There's really nothing there to enjoy that wouldn't be more satisfying as just a straight-up Spider. (Especially since, on a nuts and bolts mechanical level, the Lost would be a HORRIBLE matchup with the Shiba Bushi's Void manipulation). I vote destroyed/exiled/otherwise absent Phoenix. Twisted into service of a Jigoku Empire, they're just a bunch of jerkwad tsukai. Maybe something creepy like Kyuden Isawa or Shiro Shiba standing pristine and undamaged but utterly devoid of life, Tainted or otherwise. From what I understand, the original plans for Onyx involved the Spider taking over the Empire. Some parts of some clans ended up playing nice. For example Nitoshi, being batshit crazy already was like "let's do this!" I believe even part of the Crab stayed, largely in part because they've had a Chuda infiltrator with them for like decades taking over their men. Sometime in the struggles, Seiken bites it. The remaining loyalists flee to the Colonies, setting up a government in Exile, likely led by Shibatsu(who probably still has the Susumu with him). The Yoritomo get massacred by giant sea oni. The Naga pop up in the Shinomen Forests. We could take a page from the story paths. Something like shortly after Kanpeki's ascension, the Phoenix attempt to move their population to Heavens through a giant ritual, but something goes horribly wrong. Every single person present in the lands of the Phoenix disappears instantly, but never make it to Heavens. Now, the Phoenix cities and villages stand empty, frozen in time. Explorers often hear voices behind them or movement at the very edge of their vision. Anyone trying to repopulate the area disappears as well, commit suicide or is driven completly mad. The very few phoenix remaining (those who were elsewere in Rokugan during the ritual) are stuck with a dilemna. They are too few of them to make a difference in any attempt to remove Kanpeki from power, and they cannot leave Rokugan without answers as to the fate of their clansmate. As such, they play nice and accept Kanpeki's rule, while trying to understand what really happened on the fateful day. If that isn't satisfactory, you can also say that every single Phoenix disappeared, but it seems to me it wouldn't make a better story. I copied it also here. Sorry once again for wall of text. Okay, I listened to many ideas and came up with a little timeline to justify Kanpeki taking the throne with a lesser focus on supernatural elements (still present though). It is obvious Seiken is going mad with paranoia in this timeline, but the influence of Pan-Ku is left for you to decide and is not hardwired into the current write-up. This is only a draft, and I welcome any comments/insults you might have. I added some elements from Winter Court IV because I really like WC IV. I also didn't bother at this point checking the exact names of everyone, too lazy and too much text to worry about that for now. Seiken demotes Kanpeki and puts Shibatsu in charge of the Spider Clan. However, contrary to canon, Kanpeki swallows the insult and walk away without throwing a tantrum. A dashing Yoritomo bushi opens a black scroll to challenge Yoritomo himself and become a god. It has catastrophic consequences, create an island-sized tainted monstruosity and it destroys the Isles of Spice and Silk, along with most of the Yoritomos. The newly found Imperial Navy attacks the Oni, but suffers heavy losses. A combined effort from the Crab and Phoenix Clan manages to slow him down, but only when the Spider Clan enters the battle, using prohibted techniques, that the fight is won. Considering the catastrophic consequences if Kanpeki hadn't intervened, his men and him are allowed to walk away unharmed. Some samurais begin to see the use of the Spider Clan. Seiken is crowned and announces the dissolution of the bureaucracy. However, he also impose severe military, economic and political restrictions on all the progressist clans to punish them from siding with his brother. This prevent, among others, the Crane to fill the vacuum left by the Otomo in the bureaucracy and in court, leaving a system unable to handle all the demands and it pretty loses control. Koji puts his plan into motion, creating a shadow bureaucracy within the monasteries of Tenjin, allowing some semblance of order and accurate records of the upcoming events. Daigotsu opens a black scroll and breaks one of the seals. However, he is not blessed with that taint, much to his despair, and since the vast majority of the seals are still intact, corruption of the land and reality itself starts very slowly, in a way similar to the first stage of corruption for a mortal. Seiken summons the interim Mantis Clan Champion and announces the dissolution of the Clan. The Yoritomos are no more as retribution, surviving samurais are forced to commit seppuku, go ronin or get adopted into other clans. The other Mantis families are restored as minor Clans. The Dragon Champion meets with the Emperor, asking for clemency and offer his advice and wisdom to the Emperor to reduce, if not outright remove, the sanction to the progressists. Seiken is enraged by the Champion's words. Seiken declares the Mirumoto unfit to rule the clan and decides his mother family better suited to do the job, naming the Kitsuki daimyo the new Dragon Champion instead. Skirmish between the Lions and the Scorpions intensifes and part of the second wall is damaged in the process. Many creatures break free and roam Rokugan, killing countless samurais and heimins. Jade Magistrates attempt to get things under control, but are unable to do so until the intervention of the Order of the Spider, who succesfully defeat the roaming Onis. Public opinion, especially among the heimin and younger samurais begin to change and respect for the might and knowledge of the Spider grows. The Emperor summons both the Lion and Scorpion champion for answers conerning the Wall fiasco. Unsatisfied with their responses, asks for immediate seppuku for both of them. The lion accepts, while the scorpion refuses and leaves in disgrace, now a Ronin. Filled with grief and anger, one lion opens a black scroll to ressurect the Lion Champion, drawing the ire and disgust of the rest of his clan. It is successful, but the now-undead Champion goes into a killing spree and wrecks havoc into the Lion lands. Seiken, rapidly falling to his paranoia and horrified by the events in the lands of the Lion, declares the whole Clan a lost cause and order all the other Great Clan to unite and destroy every single samurai of the Lion. The Phoenix, the Crane and the new Scorpion Champion, in a rare show of cooperation, appears before the emperor and ask him to reconsider his decision for the good of Rokugan. In anger, Seiken executes them. Daigotsu Kanpeki opens another scroll and destroy another seal. Onis are unleashed into Rokugan in great number. However, the recent events of the LIon Clan are considered to be responsible for this turn of events and Kanpeki's plan remain secret. He is still not blessed with the taint. The Dragon Clan retreats into the mountains and close its frontier. Paranoid and now clearly losing his mind, the emperor recalls all the Imperial Legions to the capital and order to close the gates of Toshi Ranbo. This creates a nightmare for the rice supply and the capital begins to starve. The Crane approaches Shibatsu and the Spider Clan and ask for him to step up and take his brother's place. The Scorpion and the Unicorn quickly follow. Kanpeki kills his wife, opens a black scroll and destroys the third seal. He is finally tainted, but his relationship with his father allow him to hide this fact completly for a time, and share this incredible boon with his followers. Shibatsu asks for Kanpeki's help to overthrow his brother. It is received positively by the other Great Clans thanks to the recent actions of the Spider against denizens of Jigoku. The armies of the Spider marches on the capital. The lion clan being disbanded and the imperial legions starving, the conquest is easy. In one last futile effort to stop his attacker, Seiken orders the city of Toshi Ranbo to be torched to the ground. Just as Kanpeki kills Seiken in the throne room, Shibatsu approached him. He learned recently of his actions concerning the seals and while he doesn't approve them, he sees no way of turning back. He knows Kanpeki will eventually destroy the fourth seal and sit on the throne of Rokugan, probably over Shibatsu's body and a ruined empire, an alternative he cannot accept. He thus offer a deal. Kanpeki will marry Shibatsu's sister, Miaka, promise on his life (through a blood pact or something similar) never to break the fourth and final seal and leave its autonomy to any great clan that swore its allegiance to him. In exchange, Shibatsu would support his claim to the throne right now and lead the Spider Clan as the new steward of the Great Clans. Hantei XL takes the throne, give control over the court to the Crane, name the Unicorn the new right hand of the throne and reinstate the Lion Clan. He dismiss the imperial families (most of the Seppun were already dead anyway) and announces the reconstruction of Rokugan, starting with Otosan Uchi, the proper capital. The Empire is now a corrupted mess, and Kanpeki gives imperial pardon to anyone corrupted by the taint, as long as they are able to control themselves. The Empire is divided, as some samurai, including the whole Crab Clan, cannot accept the rule of Daigotsu. The rebellion is quickly dealt with and the survivors flee to the colonies. Within the next few years, thanks to a change in leadership in most of the Great Clans, the ideology of Shourido slowly creeps into the collective consciousness. The fact that three seals out of four are broken also influence everyone's view of the taint, and it is now more or less accepted (depending on the Clan, of course), as long as control is kept. It surprises no one, then, when the Emperor announces he is tainted and apart from a few extremists, nobody seems to make a big fuss out of it. Every Clan is now a dark reflection of itself. At that point, I'm open to ideas about how they changes exactly. I have a couple of questions about this timeline. First, where are these Black Scrolls coming from? Weren't they all destroyed after the Second Day of Thunder? And where are they that random Yoritomos and Lions can just open them later? Secondly, who or what is Tenjin? When the Emperor disbands the Bureaucracy and refuses to let the Crane step in to the Otomo's old role, why don't the Scorpions step up? They seem like the most likely candidates after the Crane and can help the Empire limp along for a bit under Seiken's misrule. How does Shibatsu learn about Kanpeki opening two of the Scrolls? Again, I'm not sure that simply dismissing the Miya would be a smart move for Kanpeki, especially early on, given how close the Miya are to the common people and minor clans. Maybe reducing them in power in some way might work. Making them into a vassal family of the new Imperial Families or recruiting some of them to serve as the public face of the new change in power might help? For extra irony, he might find a Miya to serve as his Imperial Herald and carry word of the new regime to the Empire. How is the Empire corrupted? I mean, in what ways is it corrupted? So what's become of this undead Lion Champion? Is he or she still rampaging about the Lion territories? I have a few thoughts about how the Mantis (or what's left of it) might change. First, the Yoritomos. I'm thinking that even if the family was officially disbanded by Imperial decree, it won't just go away. The ideals of Yoritomo, of rising to take your place against all odds, seems pretty strong with them. I could see them becoming a large ronin band. Without the Islands of Silk and Spice they'll be at a disadvantage for sure. But I could see some of them trying to salvage what they could from the Mantis lands and becoming ronin pirates and brigands while they try to rebuild in mainland Rokugan. And I can see some of them going to the Colonies to exploit the resources there. Both would have the same goal: rebuild the Yoritomo and the Mantis Clan, but given the vast distances involved I could see them diverging into two separate groups that share the name within a few generations. With the Moshi I see a bit of a split forming, but a tiny one. Most of the family would, I think, join forces with their Phoenix kin. They are very traditionalist and I don't see most of them bowing to Kanpeki, especially after word of his Taint got out. Where the leadership and the bulk of the Moshi retreats, to join the Phoenix or to reoccupy their isolated valley, I can see some who might fall into the new order. Of the dissenters, I think some might stay with the Yoritomos out of loyalty. But I think a few might join up with the greater Empire. Having experienced more of the outside world with the Mantis Clan, there'd be some that wouldn't want to go back to their valley and would want to make their own way. I could see this especially with the Moshi men, since the opportunities they enjoy with the larger Mantis Clan are no more. The Tsuruchi are actually easier to incorporate into the Empire after the fall of the Mantis Clan. They have a strict code of justice, but disdain for traditional samurai mores. They might decide the Yoritomos went too far when they cracked open a Black Scroll and destroyed their home islands. After all, a lot of innocent people would have died in the islands' destruction. I could see most of the clan taking a more hardline stance on policing and joining with Kanpeki so that'd have the authority as magistrates to punish crime. Same clan, same ideals, just a more hardline and unforgiving stance that jives with Kanpeki's reign. The Kitsune are an interesting case. There are many in their ranks who would be happy to have the Fox Clan's independence restored, even as they missed the opportunities that being part of a Great Clan afforded them. I think the fighting between the Lion and the Scorpion might affect them, given how close the Kitsune Mori is to Scorpion lands. Some of the fighting spilling over into the Kitsune Mori would keep the Fox busy. When the Second Wall is breached, their shugenja would be kept busy fending off the monsters. So they might welcome Kanpeki at first, especially if he can safeguard their land. I can also see them turning away Lion Clan refugees when they're disbanded, out of their ancient grudge against the Lion for booting them off their original lands. Even after the Lion is reinstated, I could see the Kitsune being unsympathetic and unwilling to help them recover. I think the presence of the Taint would be deeply concerning to them, but they might adopt the attitude that as long as it's kept out of their forests, it's okay. Or at least something to be endured. They'd still be focused on their connections to Chikushudo and protecting the Kitsune Mori, but their brush with Great Clan status might inspire them to more ambition than they've shown in the past. BTW, with the corruption, is the Taint still a voluntary thing or is it back to being involuntary? First, I'd like to apologize. When I'm doing a project like this, I tend to go into overdrive. Those who followed Koji a bit in WC IV might have noticed how much energy I ended up putting in things that appeared boring (Bureaucratic meetings FTW). The timeline and every single other ideas I put in this thread are drafts and I truly want to hear your opinion about them. If you spot something you don't like, or have a different twist you find more interesting, by all means go ahead and share it. If it means my own ideas get scrapped in the process, no matter how much efforts I put into them (and don't worry about that, it's something I love to do. You should see the amount of RPG game preparations I made that will probably never get played), it's for the best because it means your idea was better. If you have any cool ideas about what those answers can be, I would love to hear them. I left many blanks for others to fill. However, I can provide explanations for some of the issues. First, the rediscovery of the black scrolls was something the Story Team introduced in Gencon I think. I do not know how exactly they were going to introduce them in the story exactly, but it felt right to do it as well. In fact, the Yoritomo opening a black scroll to challenge the Mantis founder in Heavens was one of the story choice made by a Gencon winner. I just added the fact he is the one responsible for the Isles of Spice and Silk destruction. The other scrolls and the Lion one were made up. If you have other explanations, Macguffins or other magicial phenomenon that can be used instead, I'll be happy to hear them. About the Empire's corruption, I envisionned it as a similar process than the corruption of a living being. Both the body (land, air, animals and forests) and the mind (ideology and souls of the samurai and the clans) are slowly twisted into a travesty of their original form. However, since the last seal is not broken, the transformation is not complete. Some regions and aspects of life are untouched, and the rest are only partially transformed. It doesn't mean there isn't Onis running around rampaging the countryside, but it's not common. And finally, since Seiken broke the deal with Daigotsu by pushing his son away from the leadership of the Spider Clan, I think corruption is now back to being involontary. I imagine when this is discovered by the Rokugani (sooner than later), it only makes question Seiken's leadership even more. Of course, in this timeline, the whole Iweko ''I used my divine power to protect those honorable'' rebutall doesn't exist. Also, by rereading my timeline, it feels that Seiken's fall into madness is a little bit to fast. I would welcome any other incidents that could push Seiken further down this path and pushing the other clans close to Shibatsu and Kanpeki. You can't see me, but I'm doing my dance of joy. This is exactly what I was hoping for. To find a concept that, while obviously not the Clan you love, is enjoyable enough to make you want to play a character in this alternate timeline. To further explore this idea. It would be logical those more loyal to Kanpeki would either be sent away or deliberatly leave the lands of the Phoenix during the ritual, meaning they naturally outnumbers those more loyal to the ''pure'' ways (since the vast majority of them were present and mysteriously disappeared). D'aww. <3 you too, player of my favourite crotechy Isawa burn victim! Yeah, I can definitely see that killing any possibility of the Phoenix supporting Kanpeki's initial bid for the Throne, or the establishment of his regime. OTOH - suppose, as this thread is predicated on, that Kanpeki wins and solidifies his authority to the point where there's no reasonable prospect of dislodging him. And let us further suppose that he does all of this without embracing the Taint, drowning Rokugan in Jigoku, or otherwise outright compromising the spiritual purity of the Empire. Could you imagine the Phoenix adapting to the new regime? I'm sure Kanpeki will still need people attending to the spiritual purity of his people. Or do you think they'd fight to the bitter end rather than concede any possible legitimacy to the "Hantei restoration"? Now, as for the proposed timeline... my feelings on it can best be described as a very emphatic "MEH". All this nonsense about seals breaking and Jigoku suffusing the landscape leaves me cold. Especially given the amount of character assassination of Seiken that's necessary to make it plausible for anyone to support the Spider when they're unleashing Jigoku on the Empire, compared to what would be necessary to discredit him when compared to a non-cartoon-supervillain Spider. As for how I'd see the Crane fitting in under the new regime... well, it's fairly similar for both the Jigoku-powered Empire and the Shourido-powered one. Part of Crane identity, I think, is a perpetual tension between valuing things like courtesy, charm and kindness, beauty, excellence, etc for their own sake, and valuing them as means to exercise power over others. In a Spider-ruled Empire, fitting in means that the Crane will solidly embrace the latter. Rules of etiquette and courtesy no longer have any purpose except control, to cut down those who lack the skill and self-possession to follow them. Beauty no longer has any purpose except to display superiority - both "I have the skill to create this, and it's BETTER THAN YOURS", and "I command artisans of sufficient skill to create this, BEHOLD MY POWER!" Charm exists only to deceive, kindness is a trap, and the point of pursuing perfection is to be BETTER THAN YOU. I don't think the structure of the Clan changes all that much, with one exception - the Asahina, who have no real place in the new order, Jigoku-powered or not. The Crane will probably still have a shugenja family, but it won't bear any resemblance to the Asahina, except perhaps in that it will retain their artistic and crafting expertise (employed for the same purposes as above). Their commitment to pacifism, their compassion, and their egalitarian tendencies - all thrown on the garbage heap. Unless they flee into exile to hang out with other rebels and the Colonies and try to preserve the memory of what the Crane are supposed to be, which could be cool. After the big news is there any 'worth' of the story-torunaments/koteis? 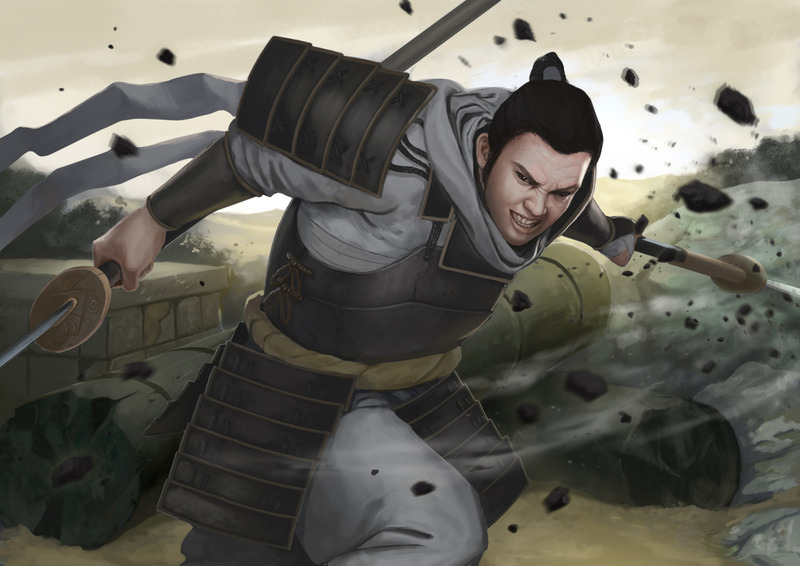 We can play, the winer can choose, but what will the new owner going to keep from the L5R story? Who knows? So why shackle ourself with the existing "canon" (a canon that is time line neutral, with several alternate settings with optional Spiders...)? Lets loose the garbage, fix the mistakes (anticlimatic Disgrace ending, Kanpeki taint... Shadow Dragon house arrest... post-Destroyer War Time jump missed opportunites... Dark Naga story... and so on so on so on) and lets make OUR setting something cool! Secondly, who or what is Tenjin? Forgot to answer that question as well. It is the Fortune of Litterature. The monks devoted to him are, in the official storyline, imperial spies working for the Otomo. Particular elements in the official timeline i don't like... this is a tough one! i love the spider. i loved the lost, and i think the spider are a natural evolution of that effort, all with the goal of putting Daigotsu's son on the throne. Was it handled well? ehhhhhh. not really. but i think i get where they were going with it. Was it handled well? ehhhhhh. not really. but i think i get where they were going with it. To Oblivion or back to the Horde? It acknowledges his upbringing among the Daigotsu and sohei without being too fantastic. And also brings home the point that he's actually quite young. Once he takes the Taint, let him be a mega-tsukai... if you must.